Every automaker wants their vehicles to be the metaphorical prettiest girl at the dance, but filling up the ol’ dance card can prove to be a quite a challenge sometimes for some vehicles. Honda, however, doesn’t seem to be having that problem, as it just wrapped up yet another year in which many of its top models bested their segments in retail registrations. What that means in terms of popularity is that Honda is appealing to more customers than any other brand these days. The retail sales statistics show that pretty clearly. Among all new vehicle registrations, California car buyers purchased 71,578 Accords and 67,293 Civics in 2014, up 17.3 and 0.5 percent, respectively, when compared to 2013 results. What's more, in 2014 some 34,980 CR-V sport-utility vehicles were purchased by car buyers in California, up 9.8 percent in the state versus the previous year, making CR-V the most popular SUV in California in 2014. "California is a critical battleground for the auto industry, and it tends to set the tone for the country in terms of product and sales trends, so it's great to see California buyers choosing Honda over the competition in key product segments," said John Mendel, executive vice president of sales at American Honda Motor Co., Inc. "We're in a very strong position with core products like Accord, Civic and CR-V and we're going to really fortify our light-truck lineup with the launch this spring of the all-new HR-V crossover and the summer arrival of the redesigned Pilot SUV." On a national basis, the Accord, Civic, CR-V and Odyssey were the top retail sellers in their respective segments for the second consecutive year, according to new-vehicle registration data from IHS Automotive. Taken together, retail registrations of Accord, Civic and CR-V topped 1 million units in 2014, totaling 1,031,266. Excluding full-size pickups, no other trio of models across the industry top retail registrations of more than one million units in a single year. National retail new vehicle registrations in 2014 for Honda's three top sellers were 382,535 units for Accord, 317,025 for Civic, and 331,706 for CR-V. Approximately 98 percent of Honda brand new car registrations in America in 2014 were to individual retail car buyers. Honda offers a full line of reliable, fuel-efficient and fun-to-drive automobiles for American car buyers through approximately 1,000 independent U.S. Honda dealers. The Honda lineup includes the Accord, Crosstour, Civic, Fit, and CR-Z along with the Pilot, and CR-V sport-utility vehicles and the Odyssey minivan. Honda has been producing automobiles in America for more than 30 years and currently operates 16 major manufacturing facilities in North America. In 2014, 98 percent of all Honda brand vehicles sold in U.S. were made in North America, using domestic and globally sourced parts. 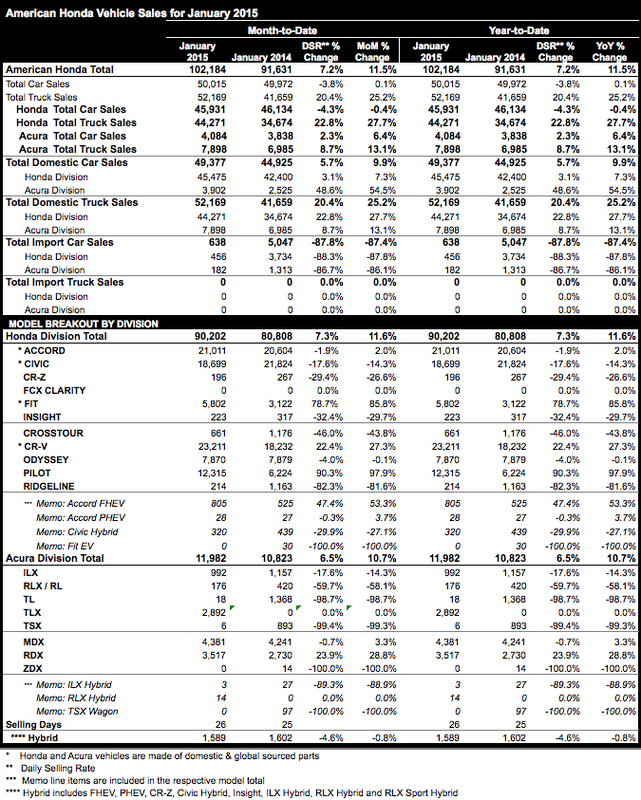 Final retail registrations for 2014 are now available, and, once again, four Honda models led the industry in retail registrations in their respective segments, according to Honda analysis of data from IHS Automotive. 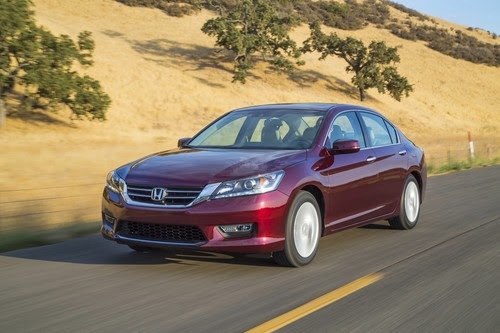 Repeating their 2013 performances, the Accord, Civic, CR-V and Odyssey were the top choices of individual U.S. car buyers in their respective segments in 20145. 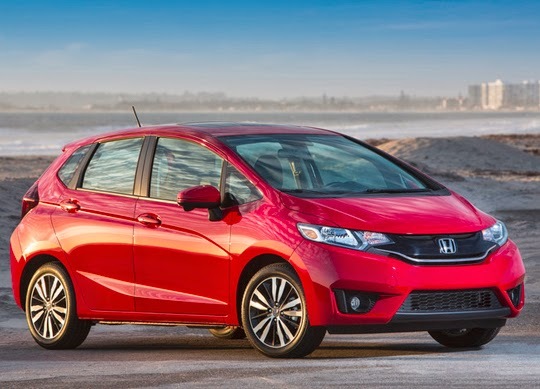 Based on retail registrations, Honda has three of the top six best-selling passenger vehicles in America. Honda's registrations to individual buyers as a percentage of total registrations was 98 percent6, the highest of any mainstream brand in the U.S.
"Retail sales are simply a better yardstick for measuring real-world product appeal, and Honda's focus on retail sales translates to higher resale value and lower lifetime ownership costs for our customers," said Jeff Conrad, senior vice president and general manager of the Honda Division. "We're looking to build on our retail sales momentum in the light truck category in the year ahead with innovative new products including the new Honda HR-V crossover and redesigned Pilot SUV." 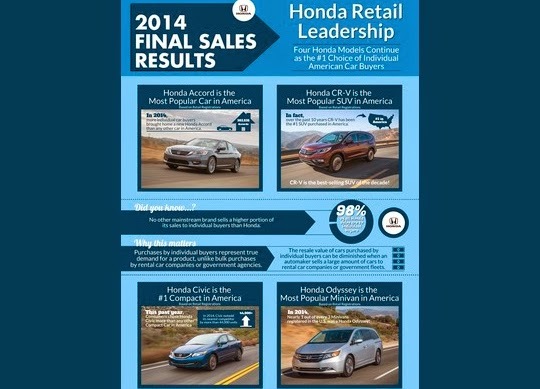 Accord, CR-V, and Civic led retail registrations in the three highest volume passenger vehicle segments in the U.S. Excluding full-size pickup trucks, Accord, CR-V and Civic rank first, third, and fourth, respectively in retail registrations in 2014. For the second year in a row, Accord, CR-V and Civic – Honda's top three selling models – accounted for more than one million in registrations in 2014. Each of these three models achieved retail registrations of more than 300,000 units. Overall, the Honda brand set an all-time annual sales record with sales of 1.37 million units. Excluding full-size pickups, the Accord, CR-V and Civic continue to hold three of the top four slots – first, third and fourth, respectively – in retail registrations in 2014. With retail registrations of 382,535 units in 2014, the Accord easily outpaced the competition as the most popular car in America for the second straight year. CR-V was America's retail and outright best-selling SUV of 2014, and the best-selling SUV of the past decade. On a retail basis, CR-V registrations rose 10.5 percent to 331,706 units compared to 2013, giving CR-V a more than 80,000-unit lead over the #2 selling vehicle in the segment in 2014. Civic retail registrations of 317,025 units in 2014 led all compact cars, besting the nearest segment competitor by nearly 45,000 units. Odyssey retail registrations of 119,615 units continue to make it the top choice among retail minivan customers – with a 32 percent retail segment share. Honda has been producing automobiles in America for more than 30 years and currently operates 16 major manufacturing facilities in North America. In 2014, nearly 98 percent of all Honda brand vehicles sold in U.S. were made in North America, using domestic and globally sourced parts. It's great to be here with you in the Windy City. Honda has introduced several important models here through the years... and in a few minutes we will continue that tradition with a model critical to fortifying our light truck lineup. The Honda brand is coming off a record-breaking 2014 and as we get rolling in 2015 the Year of Honda is starting from a position of strength and we expect an even better year ahead. Our passenger car lineup is unrivaled in the industry with a strong and clear hierarchy from Fit, to Civic, to Accord. Each of these vehicles performed especially well last year. 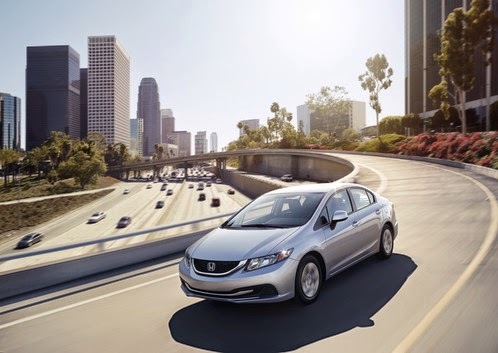 Civic the best-selling compact car with retail buyers... and sales of the new Fit continued to accelerate... up 11 percent... as we ramp up at our new plant in Celaya. But what has us really excited as we charge into the New Year...is the opportunity to provide greater value to American car buyers as they continue their enduring love affair with SUVs and crossovers. As you have seen in the last several months, industry sales of SUVs and CUVs reached record levels... both in terms of overall sales and market share. And, of course, the Honda CR-V again led the way as the best-selling SUV in America... even when key competitors increased their fleet volumes in the segment. 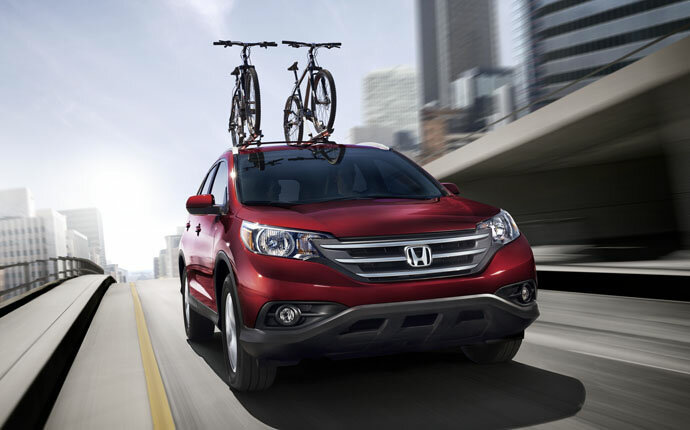 In fact, CR-V was the best-selling vehicle for the entire industry in Chicagoland. Moreover, CR-V continued its reign as the best-selling SUV in America for the past decade. And last fall, a significantly redesigned CR-V earned the Motor Trend Sport Utility of the Year award...which is where our step-by-step effort to increase our light truck leadership really began. Next up is the all-new HR-V crossover...which will draw on Honda packaging expertise to become the true benchmark vehicle in a new and growing segment. Sleek, fun, fuel-efficient and extraordinarily flexible...the 2016 Honda HR-V will crossover will deliver strong value for the money... with best-in-class fuel economy, top-class safety and, above all, Honda quality. We're confident that our customers are going to love it when it hits the showroom later this spring. And because it's unlike anything else on the road today...it's more than just a new gateway to the Honda SUV lineup...we think it will introduce a new generation of customers to the Honda brand. Further down the road, you'll see a full redesign of the Odyssey and a new Ridgeline pickup. In fact, today, I am pleased to give you a sneak peek at the styling direction for our next Ridgeline Pickup. As you can see...the new Ridgeline brings more traditional truck proportions and styling than the previous generation...while retaining space efficiency, ride comfort and flexible utility that helped make the original Ridgeline both the Motor Trend Truck of the Year...as well as the North American Truck of the Year. All of these new products ... the CR-V, HR-V, new Pilot, Odyssey and Ridgeline further exemplify our expertise and industry-leading capabilities in vehicle packaging, powertrain innovation, fuel efficiency and safety... with an added dose of dynamic styling. This strong stable of vehicles squarely position Honda to meet the needs of SUV customers with the most innovative and diverse light-truck lineup in our history. The first two generations of the Honda Pilot played a significant role in the growth of Honda's light-truck business over the past dozen years. More than that, Pilot made a major contribution to the evolution of the SUV segment. The 2003 Honda Pilot was the first mainstream 8-passenger SUV built on a car-like unibody platform... offering customers more space, more fuel-efficiency and a more refined ride and handling. Pilot has a tremendous legacy in a number of areas...including its industry leading reliability and leading safety record. The Pilot is the most durable, longest lasting SUV in its class, according to IHS Automotive. Quality, reliability, and safety are core Honda strengths... and that's due in part to the efforts of our engineers at Honda R&D Americas. Those engineers have a wealth of experience in developing Pilot for three generations now...and they understand this market very well. On the manufacturing side, Pilot is and will continue to be built exclusively in America at our Lincoln, Alabama plant... which also is home to the Odyssey and the next-generation Ridgeline pickup. More than 1.4 million Pilots have been built and sold in North America since the first generation model launched... which represents nearly a quarter of our light truck sales over that period. And while the current Pilot is still a hit with customers, the starting point for this 3rd generation Pilot, was to make sure we continue to fulfill the growing dreams of families... with a sophisticated and high-tech SUV that offers best-in-class 3-row functionality. To accomplish that, the all-new Pilot has been reengineered from the ground up to set a new benchmark in the mid-size SUV class. That means this Pilot will bring class-leading fuel efficiency and safety... as well as the incredible packaging and versatility that has defined the Pilot over the past decade plus. More than that... the all-new, 3rd generation model will be loaded with all the latest features that today's family buyers desire... with more trims, features and options than ever before. All wrapped in a decidedly new, more sophisticated, premium-feeling and refined take on family SUV styling. The next big step, in what will be an incredible cadence of new Honda light truck models, Ladies and Gentlemen... please welcome the all-new 2016 Honda Pilot. Good morning. It's great to be with you. As you can see... with sweeping character lines, an aggressive fascia and a new sleek profile... the all-new 2016 Honda Pilot expresses a youthful, modern... and yet sophisticated look. With such a departure in styling from the previous generation, I guess you could say we were thinking outside of the box. From top to bottom, we have advanced every aspect of this new Pilot... appealing to the buyer's diverse needs and wants. That means incredible family functionality when the kids are in tow...and a stylish and premium contented experience for a night on the town or an off-roading adventure. It's this dual-purpose character that we really sought to advance... increasing both family utility and the personal sophistication to meet the needs of the driver and all the passengers in every dimension of their life. Our design team in California and our development team in Ohio have worked to create a new breed of SUV that meets the diverse lifestyle needs of family SUV buyers...AND bolsters Pilot's already outstanding reputation for packaging and family-friendly utility. On the outside, the sleek, aero styling is accented by available 20-inch wheels... a first for Honda... as well as LED projector headlights, LED daytime running lights and standard LED taillights. Another key feature that contributes to both form and function is an available Panoramic Roof... bringing more of the outdoors in...and anchoring the aspirational and premium feel of this new Pilot. That same premium feel is carried over to the new Pilot interior...with higher-grade, soft-touch materials and available interior LED accent lighting throughout... making this the most well-appointed Pilot ever. The overall effect is a much more personal and premium experience in ALL three rows. Of course, packaging is a core competitive advantage for Honda and this holds true for the 2016 Pilot... with more space, more versatility and more family friendliness than ever before. To start with, the vehicle gained 3 and a half inches in overall length, providing more cargo hauling flexibility. Talk about Honda packaging prowess... this new Pilot can hold a large 82-quart cooler with no compromise to third row seating. And we've added a reversible cargo lid...with carpet on one side and an easy to clean plastic surface on the other... for the kids' snowy boots and sled. For third-row passengers, we've greatly improved the ease of entry and exit with a new One-Touch Walk-In seat feature. The fully loaded model shown here, features a 7-passenger configuration with two second-row captain's chairs and a low-profile center console for an easy walk through to get to the third row. And you can still equip the Pilot with a three-person center-bench seat accommodating 8-passengers. Adding to the more upscale interior is a host of new technologies including standard push button start and a new remote engine start system. An available heated steering wheel... and heated seats in the first two rows add to comfort. While an all-new Honda Display Audio system features a larger 8-inch touchscreen with new capabilities. These changes bring intuitive integration of smartphone functions with our latest generation of HondaLink system... enabling customers to seamlessly connect their smart phones... and open a world to Pandora and a host of other features. In models equipped with Honda's embedded satellite navi, we're introducing an all-new system featuring better graphics, 3D display of buildings, terrain and freeway signs; live search capability; and more detailed lane guidance. And when it comes to entertainment... we maintained the kids' favorite creature comfort... the Rear Entertainment System. We increased the screen resolution and added Blu-Ray capability, a Honda first. As every road-trip savvy parent knows, access to power is crucial to family happiness and tranquility...for parents and kids. And we've addressed this critical requirement with every imaginable port and plug for Maximum Family Connectivity. THIS Pilot includes up to five USB ports, 4 of them with 2.5-amp charging capability. Meaning you can charge an iPAD... or four of them simultaneously...for those extra-long trips. There's also an auxiliary jack for MP3 players and three 12-volt plugs for other devices. With these features and more, our Rear Entertainment System is now ready for just about anything. This is serious plug-and-play functionality for the connected family. And with all of these gadgets in the car, we've provided a new "tech locker," in the center console large enough to provide hidden storage for all of those iPads or even a purse. And with the new seamless door in its closed position, a shelf appears between the front seats to keep your purse close by for easy access. Powering the new Pilot is an incredibly advanced and highly efficient new powertrain from our Earth Dreams Technology lineup... to deliver an even more refined and confidence-inspiring performance. At its heart is an all-new 3.5-liter direct-injected i-VTEC V-6 engine. This powerplant incorporates our VCM system, allowing it to operate as a three-cylinder engine when appropriate. And for the first time, we're adding a new ultra smooth Idle Stop. We're pairing this new engine with two transmissions...a reengineered 6-speed automatic... and for upper grades, an all-new 9-speed automatic. The model on display here has the new 9AT with a push-button control interface and paddle shifters. Both transmissions deliver increased responsiveness and smooth shift quality for enhanced performance, and improved fuel efficiency. Combined with class-leading aerodynamics with weight reduced...up to 300 pounds from the outgoing model... the new powertrain will help Pilot reach the top of its class for EPA fuel economy ratings. We've upped the ante even further with a new all-wheel-drive system... that responds proactively to driver inputs, transferring power to where it's needed even before it senses wheel slip... to provide confidence in all-weather driving. I know we are not giving you all the specs you might want here today. But I can promise you this is the most powerful, capable and refined Pilot yet. No family vehicle is complete without a discussion of safety. And building on Honda's leadership in safety, this all-new Pilot will offer the full array of Honda Sensing technologies. 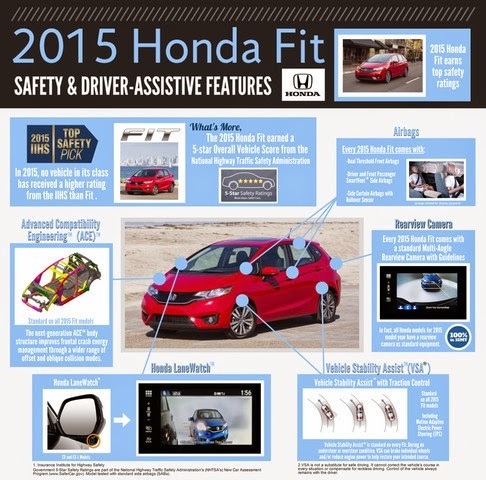 This is a comprehensive suite of leading edge safety and driver-assistive technologies that includes our award winning LaneWatch system ... plus features that are new to the Honda lineup, including... Blind Spot Information and Cross Traffic Monitor. And, like every new Honda... a multi-angle rearview camera is standard. No other midsize mainstream SUV on the market can match this level of technology... and no competitor on the market today earns both top NCAP and IIHS safety ratings, which is our target for this new Pilot. To get there we've applied Honda's next-generation ACE body structure along with a new ultra-high strength steel door ring. We expect this to help Pilot achieve the highest crash protection ratings in its class. midsize SUV class... in the way of new value, performance, fuel efficiency, safety, family utility and premium comfort. And we can't wait to share it with you in the days and months ahead. And now I'll ask Jeff to join me on stage for a quick photo... then, please come on up for a closer look at the all-new Pilot! Of all the things that make Honda one of the most respected and best-selling auto brands in the world, advanced and modern safety technology is one area in which engineers take particular pride. Up and down the model line there are vehicles with Top Safety Pick designations from the Insurance Institute for Highway Safety and 5-Star rated vehicles from the National Highway Traffic Safety Administration. 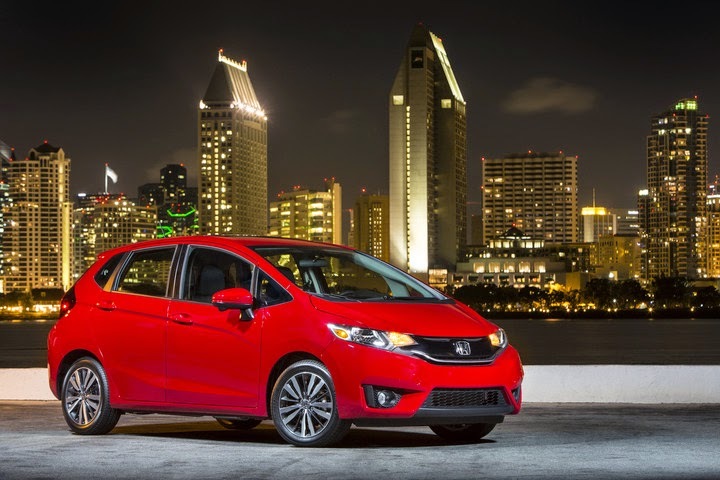 Now, the recently-updated 2015 Honda Fit joins that exclusive club as a vehicle that can boast both, with the NHTSA announcement having come just earlier this month. The all-new 2016 Honda Pilot SUV made its global premiere today at the 2015 Chicago Auto Show. Reengineered and redesigned in America, the 2016 Honda Pilot delivers more family-friendly utility, more advance technology and more premium attributes and amenities than ever before, boasting class-leading safety features, fuel efficiency and confident driving dynamics in a thoroughly modern, stylish and sophisticated new package. 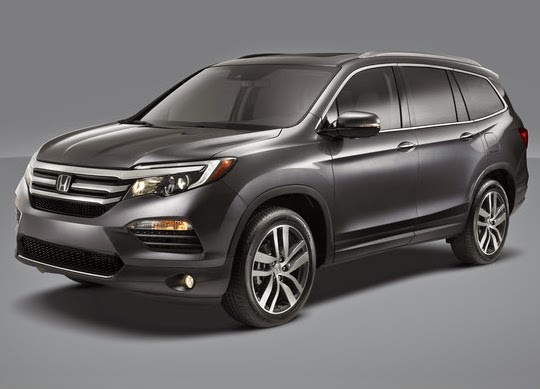 The all-new 2016 Pilot, launching at Honda dealerships nationwide this summer, is the third generation of Honda's three-row midsize SUV to be designed, developed and manufactured in America. 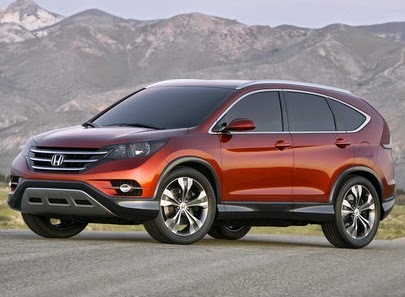 Reinforcing 2015 as the "Year of Honda," Pilot further strengthens Honda's SUV/CUV triple threat by joining the exceptionally well received 2015 CR-V (2015 Motor Trend SUV of the Year) and greatly anticipated new 2016 HR-V.
"With looks that command attention and the powerful presence of true functionality, the 2016 Pilot sets a new benchmark in the midsize SUV class with an unmatched combination of sophistication and utility," said Jeff Conrad, Honda Division senior vice president and general manager. "This means the all-new Pilot will comfort, entertain and assist active families in all aspects of their lives, whether it's an evening out for two, a road trip adventure for all or just the chores of everyday life." Additional high-end amenities include available heated and ventilated front seats, a heated steering wheel and heated second-row seats. For the first time, upper-trim Pilot models will have available two second-row captain's chairs, providing for easy walk through between the second and third rows, in addition to the standard second-row three-person 60/40 split seat for 8-passenger seating capacity. The new Pilot also incorporates Honda's latest thinking for advanced, family-friendly technology, including an upsized 8-inch capacitive touchscreen Display Audio telematics interface powered by a new Android-based operating system and more powerful processor, along with an available all-new embedded Honda Satellite-Linked Navigation System™. The new navigation system features improved graphics and new capabilities, including 3D renderings of terrain, buildings and road signs, improved lane guidance, live search function, 911 emergency services and more. The Pilot's Display Audio system enables simplified smartphone connectivity making for easier access to all the features and connectivity options of the HondaLink™ connected-car system. A 9-inch rear entertainment system with DVD and new Blu-Ray disc™ capability is available. The Pilot's new center console features a cavernous storage compartment capable of accommodating items as large as a full-size iPad or large purse. And with its seamless cover in the closed position, the console provides a convenient, non-slip surface for items that the driver or front passenger may need close at hand. In keeping with Honda's commitment to safety, the new Pilot will feature the most comprehensive set of advanced safety and driver-assistive technologies ever offered on a Honda vehicle. Together these technologies make up Honda Sensing™, a suite of technologies designed to expand the driver's situational awareness while sensing and responding to potential road hazards, including other vehicles, road obstacles and even pedestrians, mitigating the possibility or severity of a collision. It includes Honda's popular LaneWatch™ display, Blind Spot Indicators, a standard Multi-Angle Rear View Camera, and available Collision Mitigation Braking System™ (CMBS), Lane Departure Warning (LDW), Forward Collision Warning (FCW), Lane Keeping Assist System (LKAS), Rear Cross Traffic Monitor, Adaptive Cruise Control and a Honda-first Road Departure Mitigation (RDM) system. The new Pilot is expected to deliver the highest safety ratings in its class and targets a 5-Star Overall Vehicle Score from the National Highway and Traffic Safety Administration (NHTSA) and a TOP SAFETY PICK+ rating from the Insurance Institute for Highway Safety (IIHS), including a GOOD rating in all crash modes. The new Pilot incorporates Honda's next-generation Advanced Compatibility Engineering™ (ACE™) body structure, designed to more efficiently absorb and disperse the energy from a frontal collision, along with a new ultra-high-strength door ring designed to help better protect occupants. The 2016 Pilot also incorporates an all-new 3-bone platform while also utilizing high and ultra-high strength body materials, which together reduce noise, vibration and harness (NVH), improve handling, increase rigidity and reduce weight. Standard safety and driver-assistive features include four-channel anti-lock brakes (ABS) with Brake Assist and Hill Start Assist; Vehicle Stability Assist™ (VSA®) with Traction Control; an Expanded View Driver's Mirror; dual-stage, multiple-threshold front airbags, driver and front passenger SmartVent™ side airbags and side-curtain airbags for all outboard seating positions; and a new Tire Pressure Monitoring System (TPMS) with real-time display of individual tire pressures. All three generations of the Honda Pilot have been designed and developed in America by Honda R&D Americas, Inc. at its Los Angeles design studio and Raymond, Ohio, vehicle development center. The Pilot and its engine are manufactured at Honda's Lincoln, Alabama auto plant. In 2014, nearly 98 percent of all Honda-brand vehicles were produced in North America. 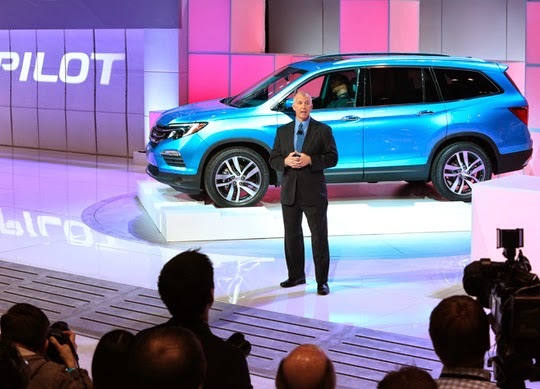 The Pilot joins the Honda CR-V – 2015 Motor Trend SUV of the Year and America's best-selling SUV for eight of the past 11 years – the popular Odyssey minivan and the dynamic new HR-V crossover, launching this spring, in Honda's growing lineup of innovative light truck offerings. An all-new Honda Ridgeline pickup will join the Honda lineup within the next two years. All Honda light truck models are produced in North America using domestic and globally sourced parts. Consumer information about all Honda vehicles is available at automobiles.honda.com. To join the Honda community on Facebook, visit facebook.com/Honda. To keep up with the most current media information about the 2016 Honda Pilot visit hondanews.com/honda-automobiles/channels/pilot. The spacious, fuel-efficient and versatile 2015 Honda Fit (http://automobiles.honda.com/fit/), has received a 5-Star Overall Vehicle Score, the top score available in the National Highway Traffic Safety Administration (NHTSA) New Car Assessment Program (NCAP). The Fit, completely redesigned in 2014, earns both a TOP SAFETY PICK rating from the Insurance Institute for Highway Safety (IIHS) and a NCAP 5-Star Overall Vehicle Score from NHTSA for 2015, making it even more of a standout choice in its segment. "The Fit shows that owning a smaller car doesn't mean you need to skimp on space, comfort or crashworthiness," said Art St. Cyr, vice president of auto operations at American Honda Motor Co., Inc. "Honda's commitment to the safety of our customers and other road users is second to none, and the Fit demonstrates this commitment in a powerful way." Already the benchmark subcompact in terms of passenger and cargo space and innovative features, occupant safety features for the 2015 Honda Fit are further enhanced through the next-generation Advanced Compatibility Engineering™ (ACE™) body structure. The ACE™ body structure improves frontal crash energy management through a wider range of offset and oblique collision modes. In addition, other body reinforcements work in tandem with the strengthened body structure to better maintain the occupant compartment volume during frontal collisions by providing additional crash energy pathways to help mitigate the forces transmitted to the passenger compartment. Standard safety equipment on all 2015 Honda models includes the next-generation of Honda's ACE™ body structure, Vehicle Stability Assist™ (VSA®) with traction control; an Anti-lock Braking System (ABS); side curtain airbags (some vehicles equipped with a rollover sensor as well); dual-stage, multiple-threshold front airbags; and front side airbags. Honda has a long history of leadership in the development and application of advanced technologies designed to enhance the safety of all road users, including automobile occupants, motorcycle riders and pedestrians. The company operates two of the world's most sophisticated crash test facilities, in Ohio and Japan, and is responsible for numerous pioneering efforts in the areas of crashworthiness, airbag technology, collision compatibility and pedestrian safety. The company is broadly applying advanced driver-assistive technologies such as LaneWatch™, Forward Collision Warning and Lane Departure Warning to its product lineup and has applied rearview cameras as standard equipment to 100-percent of its line-up for 2015. American Honda Motor Co., Inc. today reported a new January record on Honda and Acura vehicle sales of 102,184 units, an increase of 11.5 percent versus January 2014. Overall AHM light trucks led sales gains for both brands and set a January record, increasing 25.2 percent on sales of 52,169 vehicles. The Honda brand set a January record, up 11.6 percent for the month while recording sales of 90,202 vehicles. The Acura brand posted sales of 11,982 units in January, increasing 10.7 percent over the same period last year. 2015 began on a strong note for the Honda Division with record monthly sales for the brand, its light trucks and three key models, CR-V, Fit and Pilot. CR-V continued to build on its leadership as 2014's undisputed best-selling SUV in America, as the Honda's top-selling model in January with record monthly sales of 23,211 units, up 27.3 percent. Fit continued to bring record numbers of new buyers to the Honda brand, setting a new January record, up an amazing 85.8 percent with 5,802 vehicles sold in January. Pilot nearly doubled January 2014 sales while setting a new monthly record with 12,315 sold, up 97.9 percent. Led by record CR-V and Pilot sales, Honda Division light truck sales surged to a new record of 44,271 units, up 27.7 percent. "The new year is off to a strong start with three core models selling at record pace, and this is only the beginning," said Jeff Conrad, Honda division senior vice president and general manager. "With an all-new HR-V crossover coming in a few months, an all-new Pilot debuting at the Chicago Auto Show next week and more big news on the horizon, this is going to be an epic year for Honda." The Acura Division posted its best January sales result since 2007 on the strength of record sales of the MDX and RDX and another strong showing from the all-new TLX performance luxury sedan. MDX set its second consecutive January sales record on sales of 4,381 vehicles, up 3.3 percent. It was the brand's best-selling vehicle in January. RDX set its third consecutive January sales record, up 28.8 percent with sales of 3,517 vehicles for the month. "With a major mid-cycle refresh for the ILX gateway model on the way, it's great to begin the year with such strong sales," said Mike Accavitti, Acura division senior vice president and general manager. "MDX and RDX are packing a stronger 1-2 punch than ever to create new energy and momentum for the Acura brand that we look forward to carrying through 2015." Feb 2, 2015 - TORRANCE, Calif.